With a stay at Residence Inn Cherating in Cherating, you'll be near the beach, a 5-minute walk from Cherating Beach and a 4-minute drive from Cherating Turtle Sanctuary. Featured amenities include a 24-hour front desk and coffee/tea in a common area. A roundtrip airport shuttle is provided for a surcharge (available on request), and free self parking is available onsite. Located in Kuala Lumpur, My Home Hotel Kuchai Lama is within a 15-minute drive of Mid Valley Mega Mall and Bukit Jalil National Stadium. With a stay at Geopark Inn Langkawi in Langkawi (Kuah), you'll be within a 10-minute drive of CHOGM Park and Lagenda Park. Free self parking is available onsite. With a stay at Grand Inn Penang Road in Penang (Georgetown), you'll be a 4-minute walk from Camera Museum and 14 minutes by foot from Pinang Peranakan Mansion. Free self parking is available onsite. With a stay at MB Hotel in Tawau, you'll be within a 15-minute walk of Tawau District Library and Wisma Persekutuan Tawau. Located in Nilai, Hotel Seri Nilai is within a 15-minute drive of Universiti Sains Islam Malaysia and Taman Rekreasi Kuarters KLIA. Free self parking is available onsite. 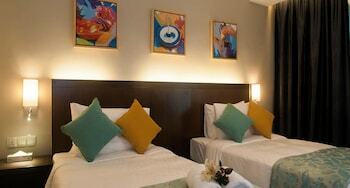 With a stay at OYO 276 Green Village in Langkawi, you'll be convenient to Underwater World and Cenang Mall.